Sir Thrift A lot: 1960's Found Photography. One of my first "found photos". I always wondered why someone would have kept this photo for so long. There is nothing to it but a couple pairs of legs & you can tell it shouldn't have been taken. Either way, I'm glad they kept it for all these years. I found it some time in 2005. 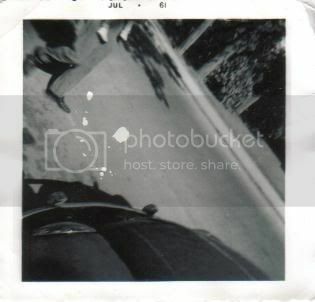 As you can tell the photo was developed in July of 1961. You can tell that photo is old. I am following you. I am glad that we can be blog friends also. Have A Fab Day!!! This is a wonderful photo! Lucky you.